I have been pleasantly surprised when a fellow blogger friend Upasna from Life on my Plate recently nominated me for The Versatile Blogger Award. She authors a beautiful blog featuring her personal dining experiences, restaurant reviews, musings, travels through this journey of life. Congrats on being nominated yourself Upasna, and many thanks for this appreciation and passing it to me. 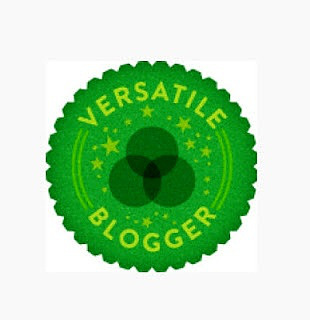 The Versatile Blogger Award is given to those blogs that are considered to have good quality writing, good photography and unique posts. Thank the person who nominated. Share 7 random things about myself. I like pets, especially dogs. I cannot bite my nails. Not even if i consciously tried. If someone mis-pronounce an English word, i always correct the pronunciation by saying it at the back of my mind. The same goes for a sentence as well. If someone talks with odd grammar, then i always correct it at the back of my mind. I keep the ice creams to melt and only after melting, i like to eat. And i prefer to have the ice cream as a payasam/kheer. I just cant stand noisy eaters. I blank out in the middle of conversations. I get lost in my thoughts and literally stare at the walls. 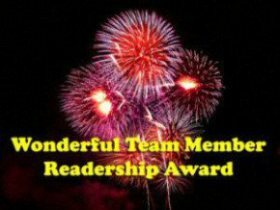 This past week, i was surprised and happy to receive the Wonderful Team Member Readership Award from a recent blogger friend, who authors a lovely blog at Aromas and Flavors from my Kitchen. Thank you for this token of love and appreciation. Here is my list of nominees. I am sure you have many awards in your kitty, but this is my token of love and appreciation for being a part of my wonderful community. Congrats on both of these awards! Fun to read some things about you…you must be very good at grammar! 🙂 You deserve the award. Have a lovely weekend! Thank you and congrats to you too. Have a lovely weekend! Aiswarya….accept my big congrats for being nominated!! Thanks for showing your love on LadiesBulletin and I feel a lot privileged to accept this. Thank you Swetha 🙂 You deserve the award!